Use the Essential Functions Priority List to keep track of critical business operations. Essential functions are those organizational functions and activities that must be continued under any and all circumstances. has to be flexible because we not only create proposals for advertising contracts, but to secure events that we sell advertising for. I am especially happy with the willingness of the Proposal Kit Staff to assist me, they always go above and beyond the call of duty." This Essential Functions Priority List is included in editable Word format that can be customized in Word or by using the included Wizard software. Essential functions are those organizational functions and activities that must be continued under any and all circumstances. Priority Essential Functions Key Personnel Required;. List Alternates Systems Needed to Perform Function Current Location of System Alternate Location? If office is closed, how can function be performed? How performed with limited staff? Leadership describes the order of succession to key positions within the organization. Orders should be of sufficient depth to ensure the organization's ability to manage and direct its essential functions and operations. Please list job titles in the table, not employee names. This section addresses the department's vital files, records, and databases to include classified or sensitive data, which are necessary to perform essential functions and activities and to reconstitute normal operations after the emergency ceases. 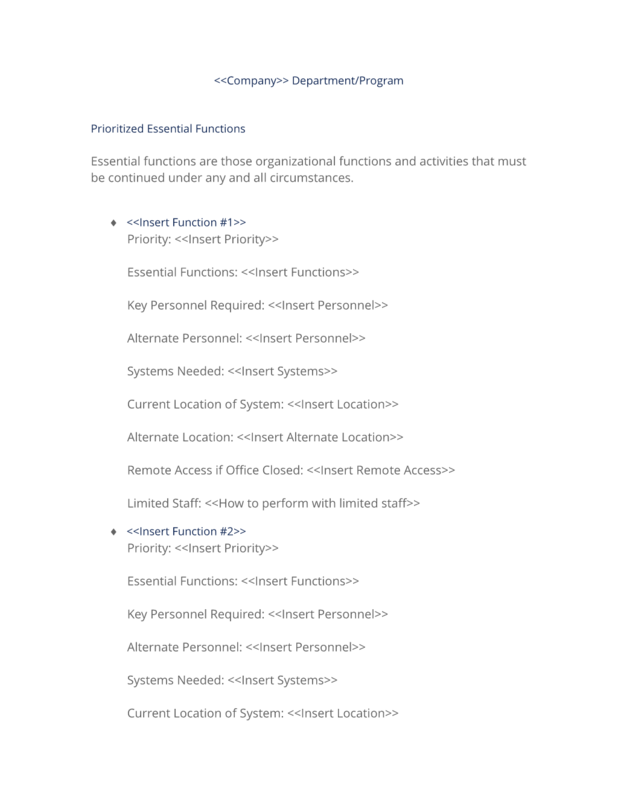 The complete Essential Functions Priority List - with the actual formatting and layout - is available in this Contract Pack.